Spring is the season when we recommend our customers arrange for their annual air conditioning maintenance. Scheduling this air conditioning service in Los Angeles, CA is the best way to enjoy dependable, energy-efficient cooling during the summer and to extend the AC’s service life. We want to address a specific step in AC maintenance—one you’ll have to do on your own. It’s regularly changing the air filter. Our technicians will change this filter during maintenance, but you’ll need to follow up and change it regularly during the rest of the year, usually every 1 to 3 months. The air filter is designed to protect the interior of an air conditioner from dust and other particles that come through the return air ducts that pull in air from the house interior. The filter isn’t specifically designed to improve indoor air quality. However, a filter that becomes excessively dirty may harm air quality. When Southern California experienced severe fires, we provided a warning to people to change the filters to remove possibly trapped carcinogens. But, as we said, the filter doesn’t usually have an impact on indoor air quality. There are other reasons it needs to be changed routinely during times when the AC runs regularly. When the filter is extremely clogged, it severely cuts into the air conditioner’s efficiency. The blower fan, which draws on large amount of electrical power, must labor harder to pull air through a congested filter. The extra stress on the blower fan motor due to a clogged filter may lead to a tripped circuit breaker. A filter that needs to be changed is the major cause of the power to the AC going out from a tripped breaker. The evaporator coil in the AC is in danger of icing up if the fan can’t draw in enough air from the return air vents. The less warm air moves over the cold evaporator coil, the colder the refrigerant in it stays—leading to ice. The drop in airflow through the ventilation system because of a clogged filter will lead to a drop in comfort around the house, especially in the rooms most distant from the HVAC cabinet. The pull on a clogged filter will distort it, making it easier for dust to get around the edges and cause damage to the motors and other components in the filter. In cases of extreme clogging, the pull can even cause the filter to fold in on itself and collapse in to the blower fan. This will cause expensive damage to the AC. 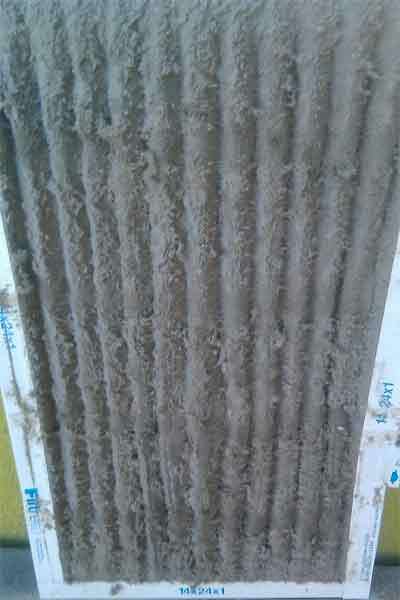 The debris in the filter can lead to the development of mold. If you don’t know where the air filter on your air conditioner is or you aren’t sure how to change it, ask our technicians to assist you during maintenance. The techs can also tell you how often to change the filter during the rest of the year. Call us for a maintenance appointment. Kilowatt Heating, Air Conditioning and Electrical has served Los Angeles, Van Nuys, and the San Fernando Valley since 1990.